What’s wrong with right wing discourse in nutshell: Jim Manzi, pun intended dept. Update: Manzi’s response to this post and my response to him can be read here. the purpose of the article was not to provide an empirical demonstration that less regulated markets tend to provide faster economic growth under many conditions than more regulated markets…. The purpose of the article was to describe why even though I (like many, many other people) accept the advantages that less regulated markets can provide, that this does not lead to the conclusion that we can or should continue on the deregulation-oriented path on which we find ourselves without considering the balancing consideration of social cohesion. I asserted (and also, once again, neither proved nor attempted to prove) that government direction of resources will tend to produce less economic growth and prosperity than freer markets under many conditions. I think the problem speaks for itself. It sure is easy to make your case if you feel no compulsion to actually, you know, make it. Heaven forfend that a Serious Thinker™ actually must bother with the mucky business of gathering empirical evidence, nor come up with some reason to believe what even the most orthodox of market fundamentalists have come to dispute when it comes to de- or re-regulating markets. * And why not simply assert….hell whatever you want, which may be right and may be wrong, but will never, in the spotless perfection of such limpid thought, actually suffer the indignity of a confrontation with the real world? This is why the GOP in its current state cannot be allowed to govern. There is for them (are you listening, Massachusetts) no disaster so great that it can penetrate the armor of received wisdom that passes for the best of “conservative” thought by our friends across the aisle. If you don’t need to prove what you know is true, then there is no reason to check to see if the policies that flow from that “knowledge” actually, you know, work. And in fact, that’s the point: if the goal of political life is to achieve power, then policy thought, making life better in our country, is an impediment. The GOP approach to public life has not changed in a generation: lower taxes, less regulation. That’s it. But, as everyone with a pulse knows, we tried that for the Bush years. It left us, as we know, with a catastrophic economic crisis, an enormous transfer of wealth from the middle class to the rich, wars dishonestly begun and incompetently managed and all the rest. And that’s not going to change as long as folks like Jim Manzi are presented as the intellectual vanguard (author of “must reads” according to members of the Sullivan diaper brigade). But in the real world, where choices of economic policy and regulatory decisions actually make a difference the kind of intellectual sloth demonstrated above — in the midst of an argument over whether one should take his ideas seriously, remember — is all you really need to know. Manzi himself is a trivial thinker, if “thought” is the word to describe his channelling of received and comfortable wisdom. And any intellectual movement that presents him as a leading member cannot be taken seriously. Yet the strategy of giving up and opting out of this international economic competition in order to focus on quality of life is simply not feasible for the United States. Europeans can get away with it only because they benefit from the external military protection America provides; we, however, have no similar guardian to turn to. We do not live in a Kantian world of perpetual commercial peace. Were America to retreat from global competition, sooner or later those who oppose our values would become strong enough to take away our wealth and freedom. Note: no ellipses, no cherrypicking. This is the entire final paragraph of Manzi’s post, his credo, his words unmediated. And boy are they dumb (and badly written). Essentially, he seems to be saying, in the context of an attempt to claim that his fevered vision of “social democracy” will doom America, that specifically, it will constrain us in a putatively zero sum competition with China. And that this competition demands military hegemony by us. And that if we change our military posture, we will somehow abandon economic competition. And that then those who oppose our values — in this context, I’m guessing this is a dog whistle for the Islamists — will come in and rob the store. It doesn’t make any more sense now does it? Rather, and this is the point the bully-boys on the right perpetually miss, the more we wallow in our wealth and freedom, and the more we extend the ideas and responsibilities of freedom to our adversaries, the more we weaken those who oppose our values. ** But this is the crowd that would rather be Right than successful, so, should they regain power any time soon, I have no doubt that the decline of US power and influence will resume apace. Some conservatives believe that the depression is the result of unwise government policies. I believe it is a market failure. The government’s myopia, passivity, and blunders played a critical role in allowing the recession to balloon into a depression, and so have several fortuitous factors. But without any government regulation of the financial industry, the economy would still, in all likelihood, be in a depression; what we have learned from the depression has shown that we need a more active and intelligent government to keep our model of a capitalist economy from running off the rails. The movement to deregulate the financial industry went too far by exaggerating the resilience—the self-healing powers—of laissez-faire capitalism. **See especially Aimai’s comment to this post. 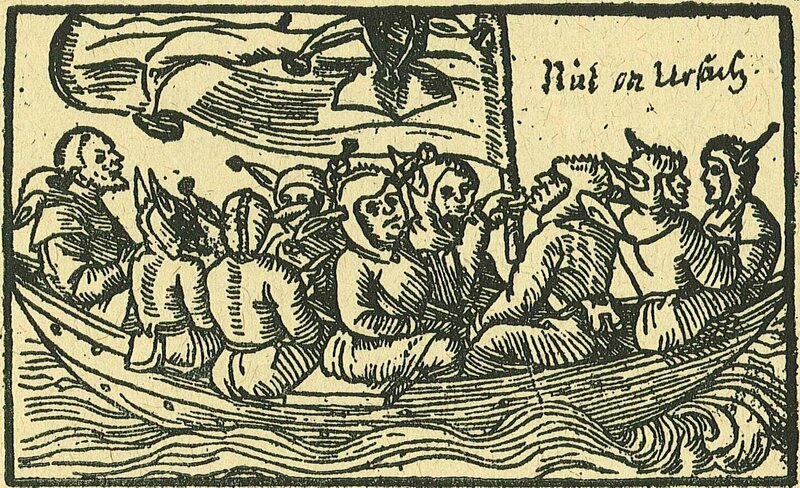 Image: Wendelin Rihel “Ship of Fools” 1549.